Little Sissy Pham has a Tinder win story so I know not everyone fails this hard, but boy am I getting great at not succeeding. I was starting to think it was me and not the dating pool, but after spending a weekend on my Tinder account with a clinical psychologist friend I know it's the dating pool. She lost hope for me after only a couple days' swiping - I've been doing this for years! So many depressants and domestic violent cases got swiped left (no) by the expert. And the few she chatted to had major issues that drove us to unmatch. Only one guy got her OK - he was super genuine and down to earth. ...But as we got to chatting I learned he just got back from overseas where he'd moved to be with a now ex-girlfriend. He was unemployed, living at home, didn't have a car and lived 68km away. My ex, The Cheater, was all of those things when we met, and I have no intention of doing long distance ever again so that fizzled out. I didn't get a date from my friend's swipes, but I have recently been on 3 failed dates all by myself. Fail #1 The suicidal ex. The German showed potential - his texts were highly engaging and funny, he asked to meet me on the first day we matched. Spontaneous! We met up that night for a walk when he said he’d be in the area and I was going for a walk anyway. Turns out he drove half an hour to be in the area specifically to see me - impressed. We had a great time on our 2.5 hour walk chatting the whole way. So we went on a second date. He was accomodating again when I got stuck at work and ruined our movie plans; he met me on the way home to buy me dinner instead. But something wasn’t right the moment I sat down. His energy was low, he looked exhausted and I couldn’t get the chat going. 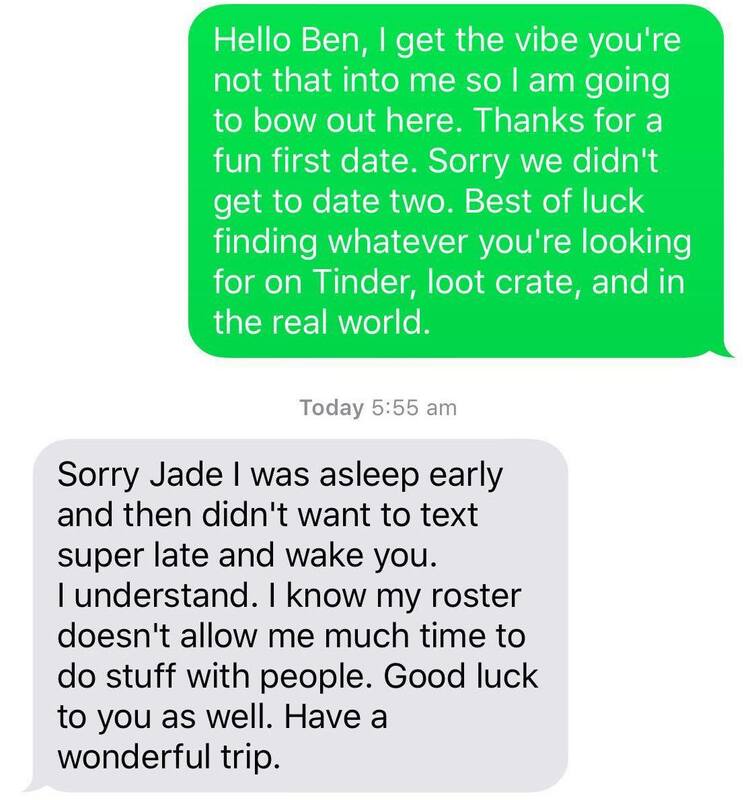 Finally, he sighed and told me he was emotionally drained because his friend, who he visited in hospital the day after our first date, is actually his ex-girlfriend and he’s her only friend in Bris. She’d set him up to go over and feed his cat while she was away, but instead of being on her way to the airport, he found her hanging herself and had to cut her down and resuscitate her, then admit her to hospital. His mood was off this night because she was being released from hospital the next day, and he was her carer. It kinda killed the mood. I felt a little selfish for being disappointed that what should have been a fun night turned into me listening to his issues and feeling helpless. I felt for him, but he needed professional support, and I'm not qualified for anything. He said he felt better for seeing me, and getting his mind off things so at least listening helped a little. I treated him to arcade games and drinks after dinner, then never saw him again because I come with minimal baggage, and he had more than I can carry. Fail #2 The seriously good and seriously, serious guy. H The Happy as I call him was regrettable in a good way. I nearly didn’t meet him ‘cause he disappeared for a couple of weeks and in Tinder land that’s a lifetime so I didn’t give him my number when I deleted my account. But we rematched a couple months later, and he explained he got the flu and that's why he stopped responding. Our date was a nice time - home-cooked dinner, pleasant intelligent chats, which lead to quite a bit of smooching, and I thought yeah, he's some one I can have fun with. Good, easygoing company. The thing was, he didn't feel the same way. He was already planning date 2 before date 1 ended, then planned date 3 before we went on date 2, which is amazing and never happens, right girls? A guy who plans ahead, thinks of cute date ideas, and isn’t afraid to say he wants to see you? Unheard of! But it made me realise he was way more into me than I was into him. And I’ve been him before this year. I didn’t want to string him along like No Fun did with me so I told him we weren't on the same page. Ugh, I really wish I’d hit it off with H The Happy. He was soooo sweet and mindful and ideal boyfriend material…for someone who isn’t me. I need goofy, I need silly, I need humour - which is most important to me. I need to laugh at life or I will curl up in a traumatised ball and die. So if any of you ladies are seeking a good guy who wants a serious relationship, hit me up - I know a guy. Fail #3 Ain’t nobody got time for dat. By dat, I mean me. I probably should have realised when I unmatched The Ginger months ago when he suddenly stopped texting that he didn’t care about me or maybe dating in general. He had been on top of my to-meet list when he disappeared so I was disappointed he thought my banter not worth a reply. When we rematched a couple of months later, he was more attentive on text so we met up. He didn't have an excuse like H the Happy who was sick. The Ginger told me he was being lazy at chatting to babes and going on dates. Again, I should have realised he didn't really care about me or dating in general. But it wasn’t until a fateful bus ride to Byron Bay where my team got to know each other too well that I clued onto what was happening. A team mate made sure the straight girls knew to: “Never compromise yourself for boys ‘cause BOYS SSSSUUUUCCKKKK. They will try to get the most out of you for as little as possible ‘cause BOYS SSSSUUUUCCKKKK. They’re the worst. Just don’t do it. Don’t compromise. Don't - 'cause BOYS SSSSUUUUCCKKKK.” Wise, drunken, comically repeated words from a guy nearly a decade younger than me. He reminded me not to be a doormat and I bailed on minimal effort Ginger that weekend. The screenshot above is our parting words. His roster is a cop out - he preferred to text me than see me, and y'all know how I feel about texting. I gave him two roster cycles and when he didn't make plans after he asked when I was free and I told him twice. But then ignored me when I asked when he was free, my ego had to take a hit and admit it wasn’t his roster that was the problem - I just wasn’t on his to-do list. It’s a shame, we had non-stop laughs on our first date and nerded out when we realised we were reading the same book in an old 14-book fantasy epic. Oh well, I wanted to see where it went and it ended up going nowhere like all of my Tinder dates. I'm taking a break from Brisbane boys to adventure in Europe right now. Currently in Paris, here's hoping I have a bit more luck in love from visiting the city of love...and urine-scented streets.